Since I began the month with a Perfect Picture Book illustrated by Debbie Ohi, I’m Bored, it seemed appropriate to end the month with one illustrated by her sister, Ruth Ohi. This is the second book written by Hazel Hutchins and illustrated by Ruth Ohi that I have featured as a Perfect Picture Book choice. The other was One Duck. Opening Sentences: The day Morgan’s little sister drew a beautiful picture on the sidewalk and then jumped right inside to pick the flowers, Morgan raced into the house to tell her parents. Synopsis: In this delightfully imaginative adventure, each experience builds on the last, heightening the tension dramatically. To save Josie from the lion, Morgan’s mother takes the chalk and draws a boat on the sidewalk, which she thinks “should do it” — but it doesn’t. The boat is heading toward a waterfall! The rescue scenario that Morgan’s dad draws on the sidewalk leads to another calamity. Neighbors, passersby, the mail carrier, all get into the project of trying to save Josie, drawing more and more pictures on the sidewalk. Nothing works. Each rescue attempt just makes things worse. Finally it is up to Morgan to rescue her little sister – but you’ll have to read the book to find out just how she does that. Why I like this book: The story is intriguing, well-written, and lots of fun, but it is the illustrations that particularly captured my imagination. The detailed, full-color pictures of the excitement that is being played out in the story carries the reader along on the adventure – while in reality, the marks on the sidewalk are simple line drawings. Did this really happen? Or did everyone simply get caught up in the imaginary play of two little girls with a bucket of colored chalk? 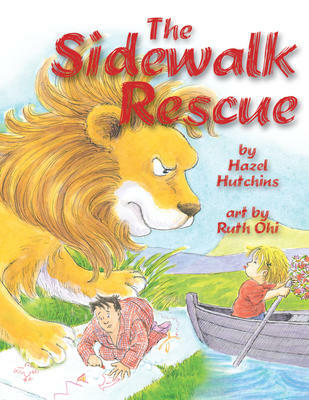 Activities/Resources: Children will enjoy learning how Hazel Hutchins thinks up her stories, from the “How I Write” page on her website, as well as learning about becoming an illustrator from the FAQ page on Ruth Ohi’s website. This book would provide a great stepping-stone for getting children to make up and tell their own adventurous tall tales. It’s also a chance to get out the sidewalk chalk and have kids draw whatever comes into their imaginations. Just be aware – when I googled “sidewalk chalk drawings for kids” I learned that in more and more places, there are city bylaws in place against chalk drawing on public sidewalks. A simple alternative would be to use a long piece of paper (such as from newsprint “ends” – the rolls of paper that are often available at your local newspaper) and draw an epic mural on that. Availability: Available in paperback in some places. Worth searching for. Thanks, Susanna! This book made me want to draw my own sidewalk pictures. This sounds delightful, Beth. What talented sisters. I really want to read this one. I’m quite sure you’ll enjoy this book, Catherine! Kids think straight to the heart of the matter! Cute! I like the idea and the name of Morgan’s little sister – Josie (my little sister)! Thought you’d like that name, Erik! It reminds me of Bert in Mary Poppins. Sounds great fun and a super inspiration for activities. Chalk is so rare these days in school, which is a shame, because drawing on the playground is such fun. It made me think of Bert, as well. Too bad chalk isn’t used as much in schools — there’s plenty of sidewalk chalk available in the stores, however! Love the image of dropping into a sidewalk picture. I agree with Joanna, a true Mary Poppins moment! Wouldn’t it be fun to pop into a sidewalk picture? What a unique book. Kids will definitely like this one. I love the imagination and the idea that only her sister can figue out a way to rescue her. Wonderful choice. Will have to check it out. Thanks, Pat. It’s truly a delightful book. This duo of Hutchins and Ohi produce great books. Beth…what a unique book idea…and it reminds me of “Harold and the Purple Crayon” and also one of the books reviewed this week for PPBF, “Rocket Writes a Story”. But this one has more of a fantasy-land aspect to it…love the dropping into the sidewalk picture…wouldn’t we all have loved to do that at one time or another. :) Great review…thanks for sharing it with us! And thanks again for making sure I got to hear Emma’s Q&A on Children’s Book Hub FB. ..it was an amazing teleseminar…jam-packed with valuable info! There used to be a cartoon called “Simon in the Land of Chalk Drawings” which also was a delightful way to get right inside drawings. I’m so glad you got so much out of Emma’s Q&A — and as you know, I’m beyond delighted that you won the JWFK course through 12×12! This is a lovely book and yes it reminded me also of Bert’s sidewalk drawing in Mary Poppins! I also love sidewalk drawings and used to love doing it myself. Also love drawing with a stick in the sand another favourite pasttime. Must look this one up. Drawing of any sort is great fun for kids. Hope you can find this book in Kiwiland! Another good one. As my little guy is exploring his imagination, I love books that encourage adventure. Oh, I think Enzo would have fun with this one. I *know* you will!